holiday | Violet Makes Things. Guest Post: Abby’s Christmas Crack. This is a guest post from my delightful friend Abby. She made this recipe for our work holiday drop-in; I am pretty sure that all of it was gone into the bellies of our staff before anyone managed to drop in. It’s called “Christmas Crack” but I feel confident that we could rename it “Violet’s Birthday Crack” or “Monday Crack”. Whatever. Here we go. Let’s start with a photo that Abby stole from the internet..
First and foremost – relax! this is kind of a no-brainer type of recipe so don’t freak out about it. don’t go all A-type or freak-out – just make the damn thing. Maybe have a drink to help with the relaxing (this part is optional but recommended). Start by lining a medium-size/regular cookie sheet with tinfoil. The thing needs to have sides. Don’t be all Martha Stewart-y and think parchment is better here – it will stick. $.50 dollarstore tin foil will do the job, just make sure it covers the cookie sheet (and up the sides) to make for easy clean-up. Dump the pretzels onto the cookie sheet and give’r a shake. Aim for about a single layer – roughly half of the bags I buy. But again, refer back to step 1. Preheat the oven to 350F. Meanwhile, melt the butter and stir in the sugar in a pot. Again, go back to step one. This isn’t rocket science folks. Melt the butter however you want – hi, medium heat – doesn’t matter. Add in the sugar and stir until the butter is fully incorporated. This takes a few minutes but really, just take a breath (or a drink) and it will happen. Keep stirring til it comes to a pretty decent bubble, then turn down the heat to low. Watch the pretty bubbles and stir for about 2 minutes. Pour the bubbly sugar/butter mixture over the pretzels. You guessed it – refer back to #1. Try to pour it over most of the pan but the stuff will spread out in the oven. Promise. Pop the pan into the oven for 5 minutes. Turn off the oven. Pull out the pan – that delicious goo spread out didn’t it? Evenly sprinkle the chocolate chips over the whole bubbly thing. Pop back into the (now off but still hot) oven for a minute-ish to melt the chocolate. Remove from oven – use a spatula to spread out the chocolate. Some of the pretzels might not be fully covered, some might shift – this ain’t a beauty pageant kids. Relax. Sprinkle with coarse sea-salt – however much you want. Let sit for a few minutes while you clean up (one pot. nice.) and then pop in the freezer for about an hour. Remove from tinfoil and break into piece. Done! Store in a container in the freezer. Best served if it’s sit out at room temp for a little bit but I’ve been known to grab a piece every time I pass by the freezer. Ain’t no shame. Looks like a lot of steps but to review: Line a pan. Dump pretzels. Shake. Let butter and sugar make pretty bubbles. Pour. Oven. Chocolate. Oven. Salt. Freezer. BAM. Now I’m hungry for donuts. My friend Rebs sent me this link. 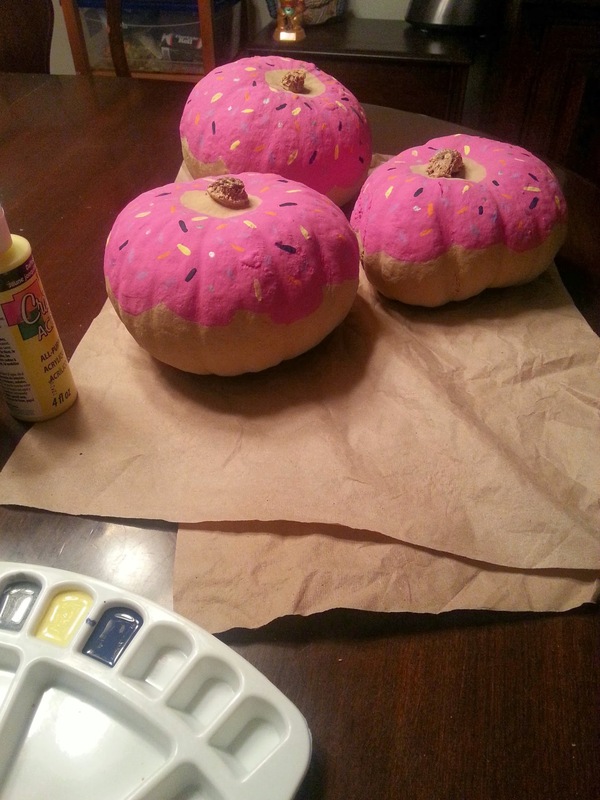 They’re not difficult to make – just paint some pumpkins – but the entire Universe was conspiring against me actually doing it. The dollar store, where I went to buy paint, didn’t have many colours (so all 3 of mine are frosted with pink icing). The grocery store where we normally get pumpkins didn’t have any that were the right shape (so I bought squash instead). But, all that aside, they turned out nicely and I’m pleased.